Many musicians today find it quite satisfying to go to their local music shop to trade in their old instruments for newer ones. Usually because they believe it is an upgrade, most musicians feel no remorse letting go of their old equipment. However, there are those times where shortly after making a trade, a musician realizes that the grass is not always greener and soon regrets the move. This story is one of those times. Meet guitar player Robert Shulman. Shulman, a 63-year old professor of pediatrics at Baylor College of Medicine in Houston has been on a longtime hunt to reclaim his very first guitar. Shulman has become so desperate that he has recently purchased an ad in the June issue of Vintage Guitar. 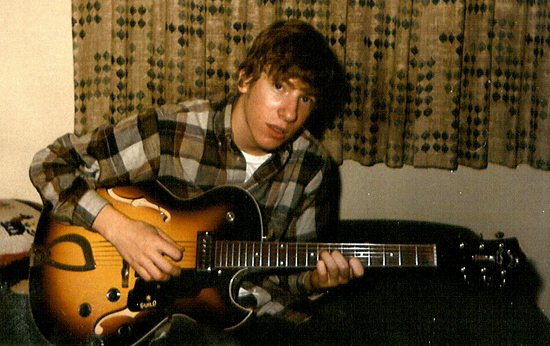 “Sorry I sold it!” headlines a photo ad featuring a teenaged Shulman with his circa 1965 Guild T100D guitar. Shulman’s history with the Guild dates back to 1965 when he was a 15 year old learning to play guitar. Tired of borrowing his sister’s guitar, Shulman cleaned backyards and did pretty much anything he could in order to save up for his own instrument. Shulman didn’t have quite enough saved for the guitar, but thankfully his parents came to the rescue. During his college days a few years later, Shulman traded in his Guild for a Gibson. It didn’t take long for Shulman to regret his hasty decision. “By the time I realized I had made a big mistake, the Guild had disappeared,” he shared. In recent years, Shulman has taken advantage of Vintage Guitar’s free ads in hopes of being reunited with his guitar. Finally, he opted to up the ante. Shulman, who still plays in a cover band that performs at parties and weddings, hopes he’ll receive a legitimate lead some day soon. Shulman sold the Guild, serial number 40761, to Rhythm City in Atlanta circa 1969. In the event you have any information about this guitar, please contact Shulman at RSHULMAN@BCM.EDU.